Here’s the recipe that won me 2nd place and W1,000,000. I’m putting measurements here, but you really need to taste and adjust as you go. Puree the Korean pear, chopped onion in a blender. Add the liquid ingredients and taste. It should be fairly sweet. When you think it’s sweet enough, add a little more starch syrup. Add the beef and mix thoroughly. Hands work best. Cook the beef and sliced onions on medium high until much of the liquid has evaporated. Combine all the ingredients and adjust for taste. It should be slightly fruity and acidic with a good bit of heat to back it up. Put the egg yolk, garlic, lemon juice and salt in a bowl and blend with a beater. Slowly drizzle in the olive oil while blending. This will take a while. Be patient. I drip it in a bit at a time and let it mix. When it starts getting some firmness and volume, you can increase the stream. The goal is to make it thick like a mayonnaise. Gently fold in the gochujang. Taste and adjust. Add the smoked paprika. Taste and adjust. Add the starch syrup. In the end you want something sweet and smoky with some good spicy bite with some brightness from the lemon and a hint of garlic. Lay down a tortilla and lightly sprinkle it with cheese. Place the bulgogi meat on top of the cheese. Add a little smoky gochujang aioli. Sprinkle a little more cheese and cover with another tortilla. Preheat the oil in a skillet on medium high. Cook the quesadilla until golden on both sides and the cheese has melted. Cut into quarters or eighths. Remove the stems off the sesame leaves and roll them tightly like a cigar. Slice them into thin ribbons (chiffonade). Serve with Korean pear salsa and more smoky gochujang aioli on the side. Sprinkle the sesame leaf ribbons on as garnish. This looks really really good 🙂 Where would us mere mortals find TBS smoked paprika? Good question. I got a big bag here. Let’s see if we can find a source. Penzeys.com has great smoked paprika and spices from all parts if the globe. Thanks for this recipe! 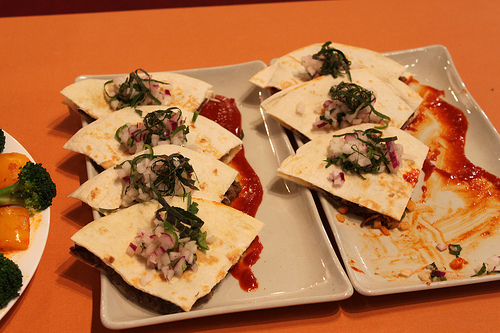 Bulgogi Quesadillas are new to me and the pictures just made me more curious about it. Hopefully I can try this out soon.